Of all of the different forms of weight loss surgery which are nowadays the sleeve gastrectomy with duodenal switch is perhaps the most . 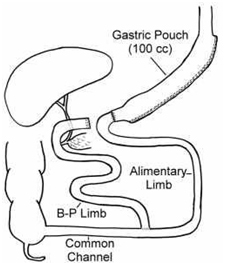 The Duodenal Switch procedure, also known as the Bilio-Pancreatic Diversion with Duodenal Switch procedure or the Vertical Gastrectomy with the Duodenal Switch. This procedure generates weight loss by restricting the amount of food that can be eaten with the removal of stomach or vertical Gastrectomy (the greater curvature so that the volume is approximately one third its original) and by limiting the amount of food, specifically fat, that is absorbed into the body Duodenal Switch. This has a significant component of malabsorption, which seems to augment and help maintain long-term weight loss. The malabsorptive portion of the surgery reroutes a large portion of the small intestine, creating two separate pathways and one common pathway. The shorter of the two pathways, the digestive loop, takes food from the stomach to the large intestine. The by-far longer pathway, the Bilio-pancreatic loop, diverts bile from the liver to the common path. The common path is a stretch of small intestine, approximately 75-100 centimeters long, in which the contents of the digestive path mix with the bile from the Bilio-pancreatic loop before emptying into the large intestine. The point of this arrangement is to reduce the amount of time the body has to capture and absorb nutrients and calories from food in the small intestine as well as severely limit the absorption of fat. Which seems to augment and help maintain long-term weight loss? Who is an ideal candidate Duodenal Switch Surgery ? Have a complete understanding of the procedure and the lifestyle changes necessary afterwards. Duodenal Switch Surgery how it works? The initial part of this procedure is a sleeve gastrectomy in which the stomach is divided vertically and approximately eighty-five percent is removed. The small sleeve shaped stomach which remains retains the original outlet to the intestines and functions just like a normal stomach. This initial part of the surgery is aimed purely at restricting the quantity of food that can be consumed and this restrictive surgery cannot be reversed. The second phase of the operation is to make the duodenal switch adding in an element of malabsorption surgery that is largely reversible. Unlike restrictive surgery that causes a loss in weight by physically preventing the patient from eating too great a quantity of food, malabsorption surgery contols the body's power to absorb calories from a meal as it passes through the digestive tract. During surgery the intestine is divided and a relatively small section (generally approximately 150 cm in length) is used to make a bypass from the duodenum, which is situated near to the outlet of the stomach, to a point near the end of the intestinal tract thereby bypassing the major part of the digestive tract. The consequence of this duodenal switch is that food that passes through the intestinal tract only mixes with the body's digestive juices in the short final section of the intestine below the switch thus allowing the digestive juices very little time to digest the food and absorb calories from it. The main advantage of the Duodenal Switch surgery is that by using two approaches, weight loss tends to be achieved more quickly and more permanently. The patient experiences no Dumping Syndrome because the pylorus is preserved as the pyloric valve between the stomach and small intestine is preserved. People who have undergone the DS do not experience the Dumping Syndrome common with people who have undergone the Roux-en-Y Gastric Bypass Surgery. Those who undergo the Duodenal Switch often find that comorbidities such as Dumping Syndrome, Diabetes mellitus Type 2, Arthritis, and high blood pressure are significantly relieved in a short time after the surgery. Gastric dumping syndrome, or rapid gastric emptying, happens when the lower end of the small intestine, the jejunum, fills too quickly with undigested food from the stomach. "Early" dumping begins during or right after a meal. Symptoms of early dumping include nausea, vomiting, bloating, cramping, diarrhea, dizziness and fatigue. "Late" dumping happens 1 to 3 hours after eating. Symptoms of late dumping include weakness, sweating, and dizziness. Many people have both types. In addition, people with this syndrome often suffer from low blood sugar, or hypoglycemia, because the rapid "dumping" of food triggers the pancreas to release excessive amounts of insulin into the bloodstream. The argument that many surgeons use against the duodenal switch is simply that insufficient absorption takes place so that there is too great a danger of anemia, protein deficiency and metabolic bone disease. The sleeve gastrectomy with duodenal switch is also debatably the most complicated type of weight loss surgery and a lot of surgeons think that it carries an unacceptable level of risk. Regardless of the risks the duodenal switch is nevertheless a surgical option and can be very effective, particularly in people with a very high body mass index.